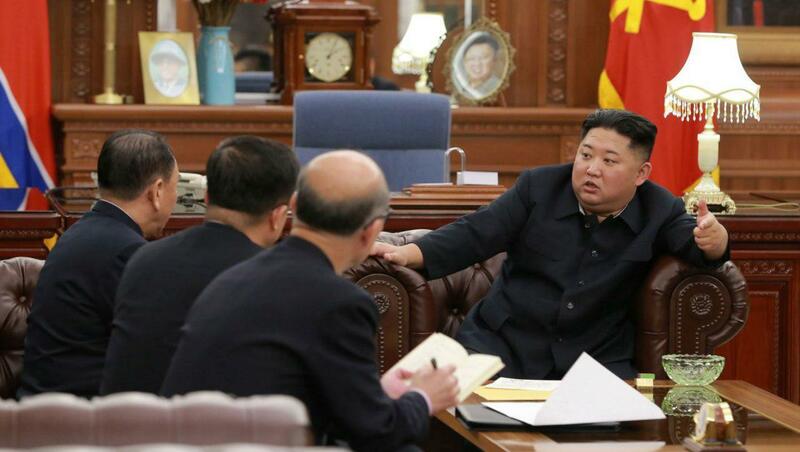 PYONGYANG, Jan. 24 (Xinhua) -- Kim Jong Un, top leader of the Democratic People's Republic of Korea (DPRK), has instructed officials to make "good technical preparations" for a second DPRK-U.S. summit, the state-run Korean Central News Agency (KCNA) reported on Thursday. Kim met the delegation to the recent DPRK-U.S. high-level talks, led by Kim Yong Chol, vice-chairman of the Central Committee of the Workers' Party of Korea, and was briefed on the results and details of the visit to Washington, the report said. Kim expressed satisfaction over the results of the talks and "set forth tasks and orientation for making good technical preparations for the second DPRK-U.S. summit high on the agenda," said the KCNA report. It was the first time the DPRK media reported about the possible second DPRK-U.S. summit, which has made international headlines recently. But the KCNA did not give any further details about its timing and location. The DPRK delegation led by Kim Yong Chol visited the White House, met U.S. President Donald Trump and "discussed the issue for the second DPRK-U.S. summit and also had negotiations with the U.S. working group on a series of issues to be settled between the two countries," the report said. The DPRK delegation met with U.S. Secretary of State Mike Pompeo last week. The U.S. side said Trump would meet the top DPRK leader again, after their first historic meeting in Singapore last June. The DPRK leader received a letter from Trump presented by Kim Yong Chol and "expressed great satisfaction" with "the good personal letter sent by President Trump." "He spoke highly of President Trump for expressing his unusual determination and will for the settlement of the issue with a great interest in the second DPRK-U.S. summit," the KCNA said. "We will believe in the positive way of thinking of President Trump, wait with patience and in good faith and, together with the U.S., advance step by step toward the goal to be reached by the two countries of the DPRK and the U.S," Kim was quoted as saying.